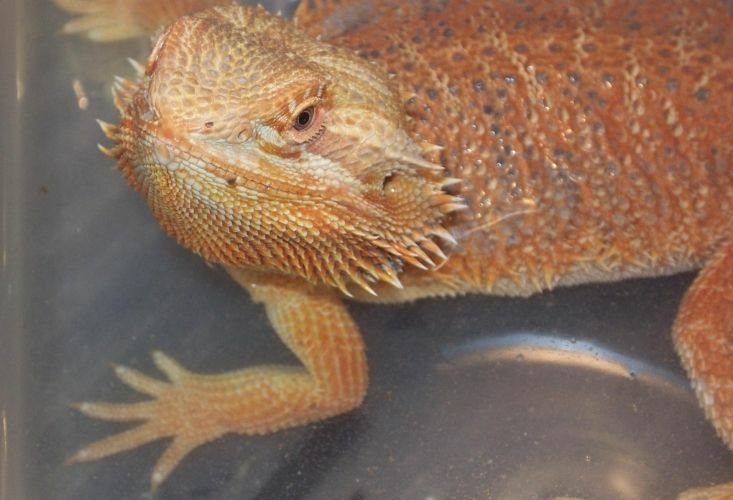 Jewel is my first Dragon. 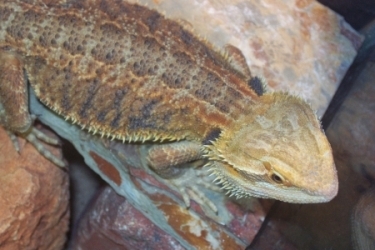 She was purchased directly from Rob Misiewicz who specializes in hypo-pastel dragons. 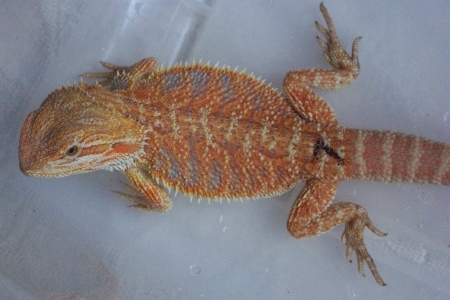 When cold and basking she is a dark rust orange and true red with tiger stripes. 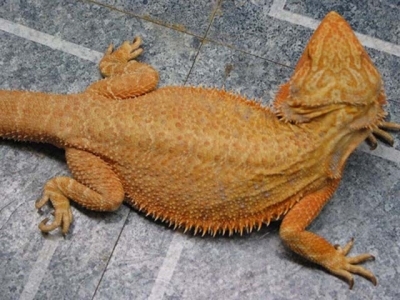 When fired up she turns bright orange and red/orange and is almost patternless. This is Jewel with her brother at 7-8 weeks. 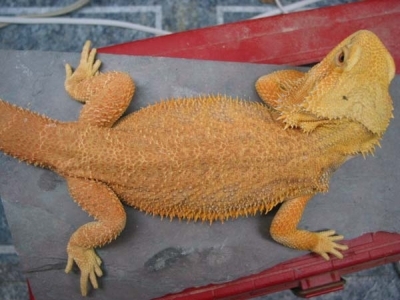 3 months old and turning more Red/Orange! Jewel is on the right. 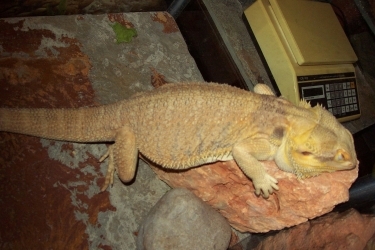 This is Jewel around 5-6months right after she shed out her back. 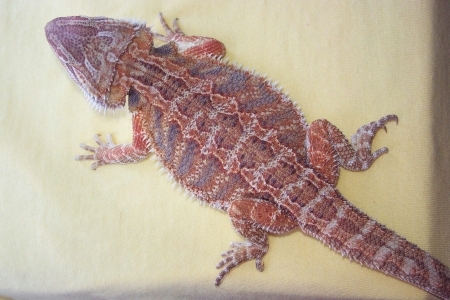 Color comparison at 14 months old . Look at that red and she isn't even fired up! 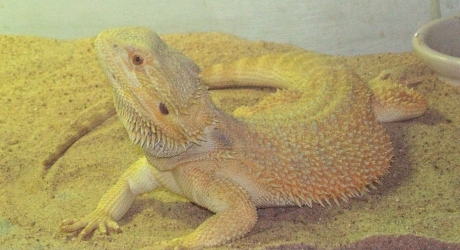 Blaze was bred by Dragons by Nature. 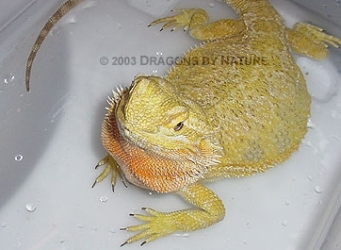 His parents are "Ceasar", a huge Red Flame male, and "Pumpkin" a Yellow Sandfire. 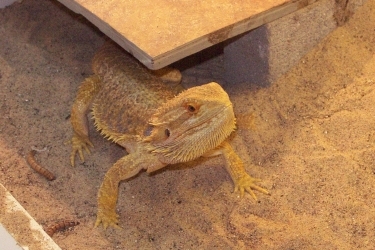 Both of his parents have been purchased by "Sunshine Dragons". 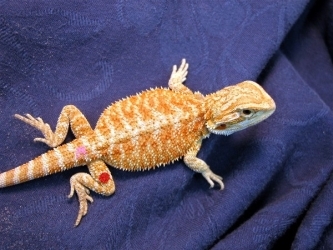 Blaze started off as a very intensely colored hatchling, gaining a great deal of red as he grew. 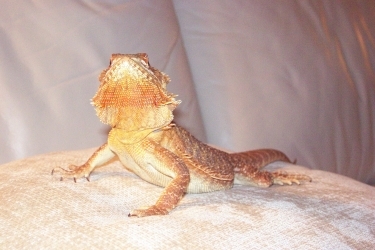 At about 12 months of age he lost most of that red and is as I have him pictured now. 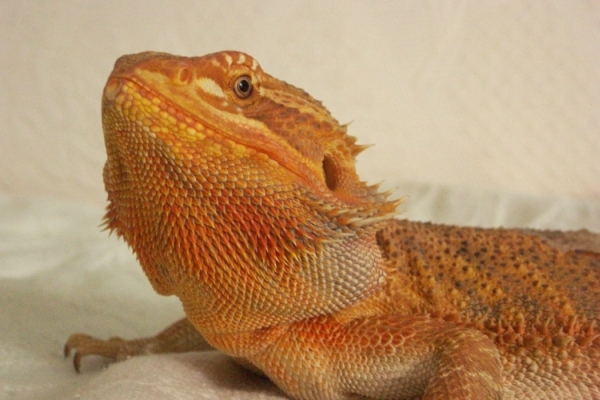 He is the type of dragon that shows his best colors at night. 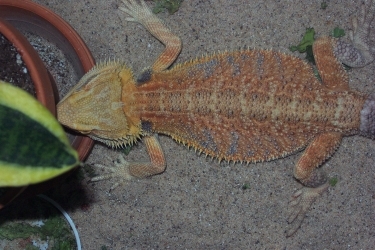 Where he use to be extreme red he now shows an all over cream and yellow with a light orange stripe on his back. Very sweet temperament but an aggressive courter! Photo published with permission by Ryan Hill See th RED! 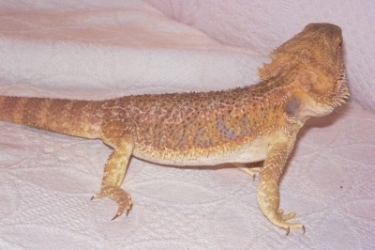 Flame was purchased from a local breeder in Florida. 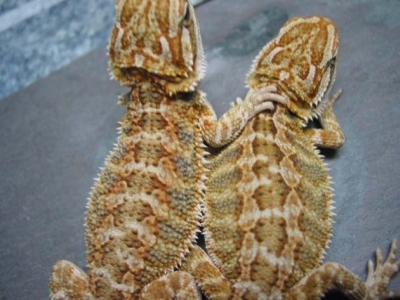 His grandparents were red (Bert and Hester Langerwerf "Agama Internaional") , dad an orange and mom a lemon pastel also from another local breeder in Florida. 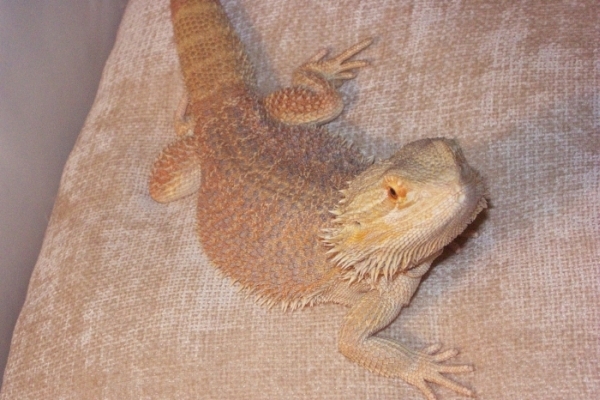 He is the "snuggler" in my group of dragons. Always wanting to get as close to me as possible. 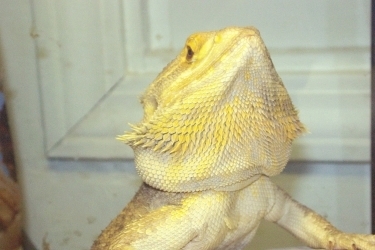 Very friendly , very courteous when sharing meals with females, always taking turns, but is a very aggressive breeder. 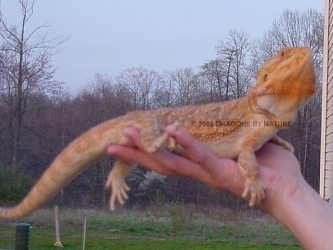 He glows a bright citrus yellow with a light red orange flame on his back and ears when fired up. 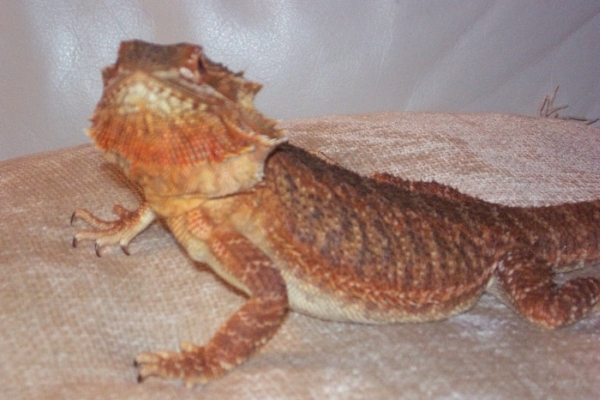 When cool he darkens down to a rusty orange with a darker red flame on his back and ears. 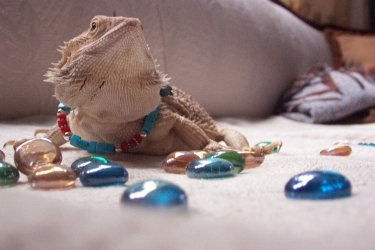 For a normal dragon Sandy is a pretty girl. 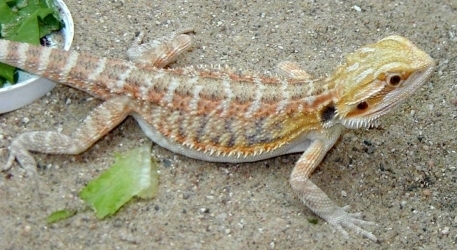 She has light peach coloration on her head and arms. Her back is cream and tan with blue bars. 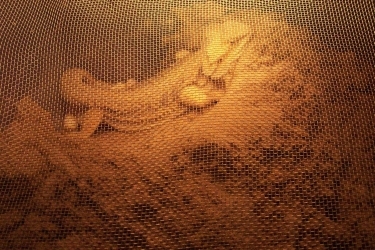 When she is dark or fires up she blends nicely with the sand in her encloser. 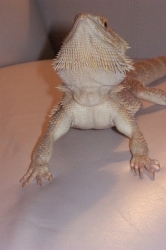 As can be seen by her weight she is quite the piggy but is also a very non aggressive dragon. 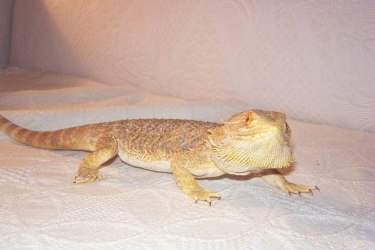 Purchased from "My Bearded Dragons" as a hatchling, Talon is a great example of what a hypopastel dragon should be. 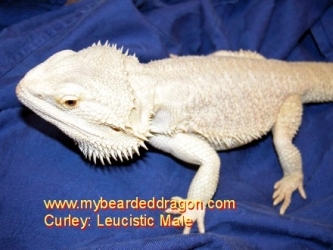 His dad is "My Bearded Dragons" leucistic, Curley, and his mom is a Dachiu hypo red. 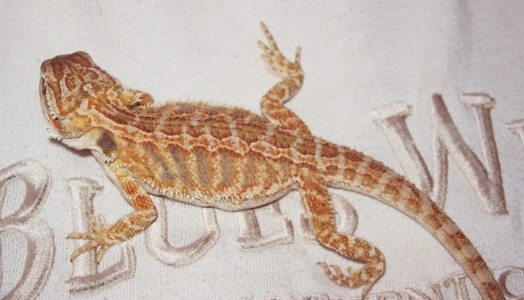 His back fluctuates between a very bright patternless light orange to a darker orange as shown in the picture above. His head and forearms are always a constant yellow. 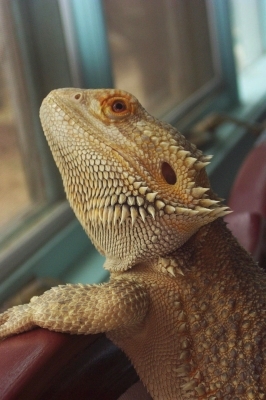 He is what I would call a very hyper dragon and is nervous around strangers. 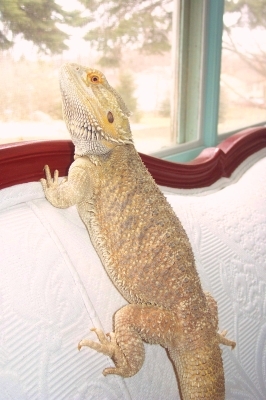 Around me however, he is always calm and easily handled. 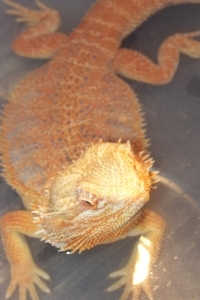 He is still young and is calming down more and more as he gets older. At 7 months old he discovered that there are girls in the world. 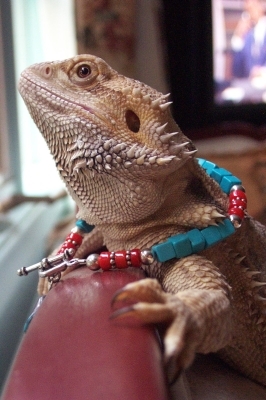 He now blackens his beard and is doing his best to court his new "love", Jewel. 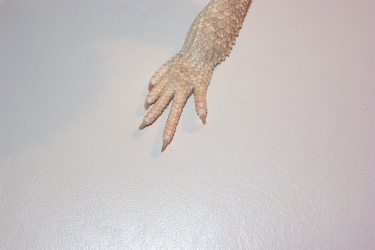 When he is older expect to see a pairing between Talon and Jewel! 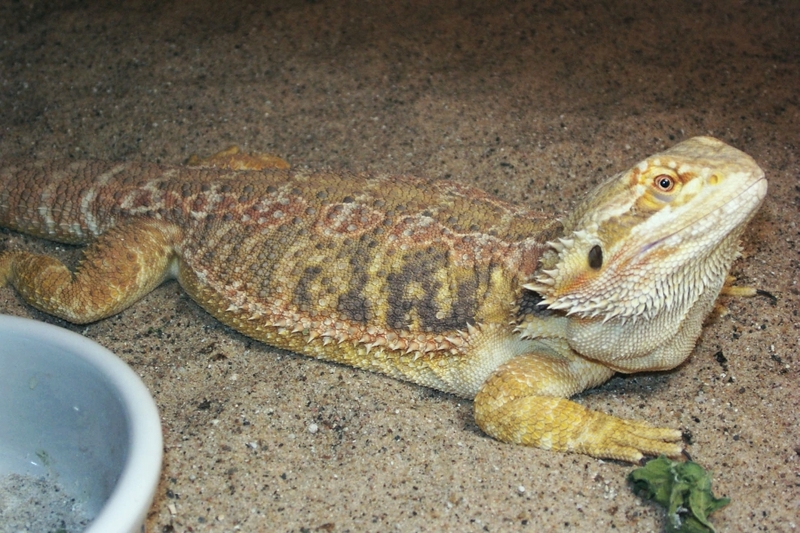 Ruby was purchased from a small breeder from Pennsylvania who only sells at a couple of local shows. 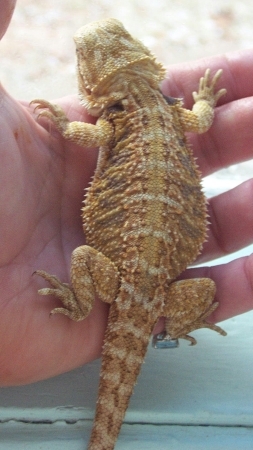 I didn't acquire her till she was 5 months old and even though she was the same size as the rest of the females her age being sold she seemed small but healthy to me and her deep red color was outstanding so I couldn't resist. 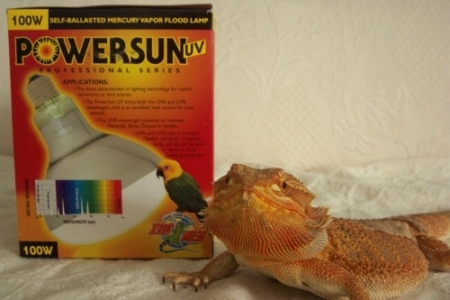 Since I have had her, I've exposed her to the Power Sun bulbs 16 hours a day and have been stuffing her with silkworms and crickets. 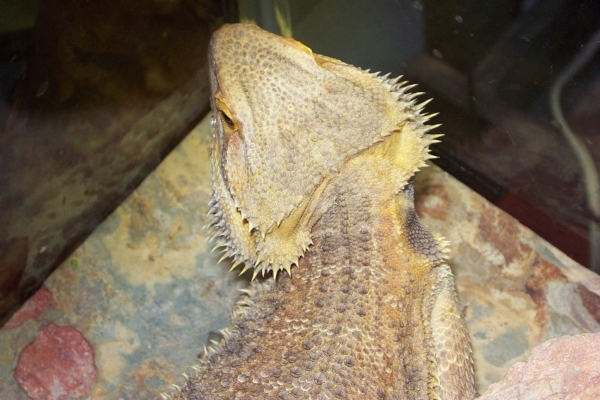 She has more then tripled her weight and length as of Dec 2005 and is in constant shed. 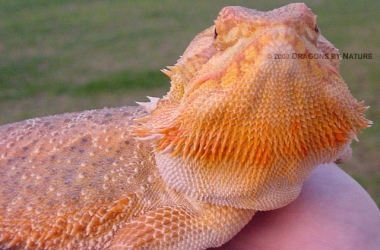 With each shed she continues to get a richer red color then goes right back into shed again. 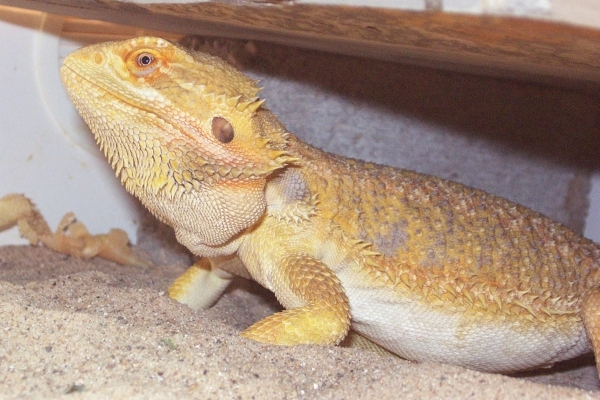 In all the pictures I have of her she seems to always be going into or about to shed. She was very well socialized when I got her and still remains a sweetheart today! When she matures expect to see a pairing between her and Flame. 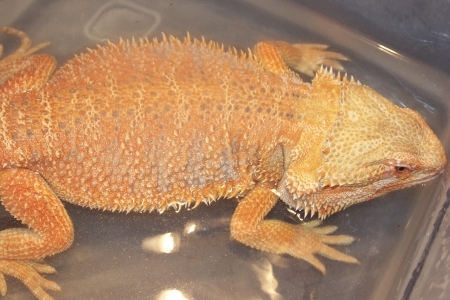 Red/Orange x Lemon Pastel X Unknown/normal? 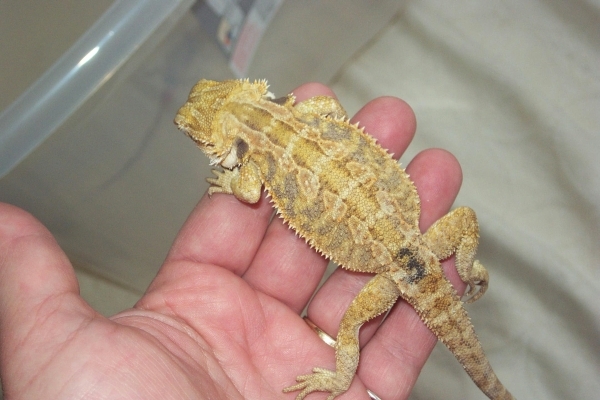 She is the biggest hatchling from my Flame X Sandy breeding. Very sweet affectionate girl. She wasn't the most colorful but she won our hearts so she is here to stay! Her size, genetics and sweet attitude should be able to add alot to future breeding projects but for now she will just be spoiled till she grows up! Parents are pictured above. 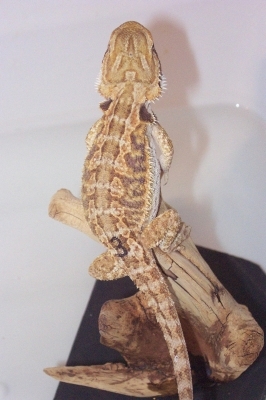 Sparky is a Jewel X Talon Breeding. 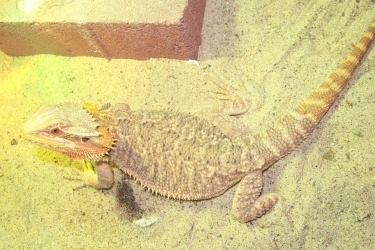 He was the largest and most colorful of all the Hypo's produced by this pairing. He is only 7 and 1/2 months old in this picture! 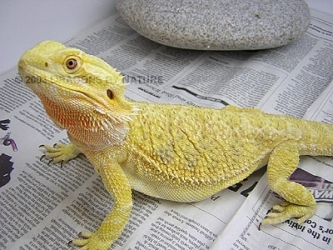 He has a great attitude and will make an excellent pet and breeder!